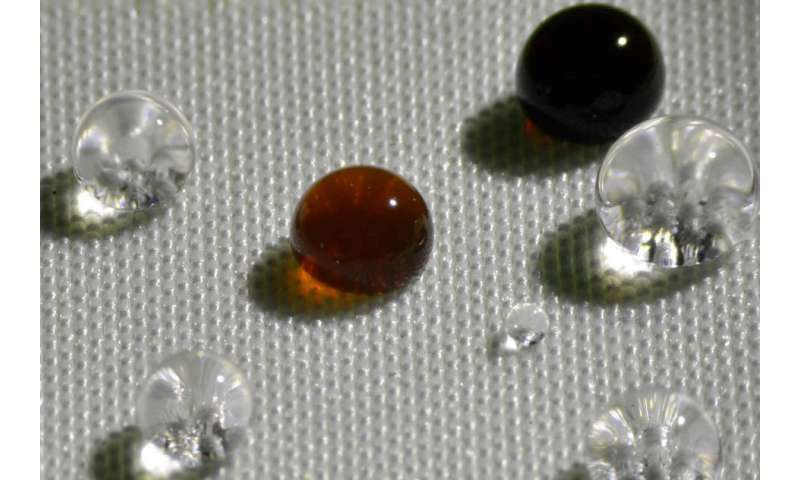 "Most fabrics that say 'water-repellent' are actually water-resistant," says Varanasi, who is an associate professor of mechanical engineering. "If you're standing out in the rain, eventually water will get through." Ultimately, "the goal is to be repellent—to have the drops just bounce back." The new coating comes closer to that goal, he says. Research has shown that polymers with fewer than eight perfluorinated carbon groups do not persist and bioaccumulate nearly as much as those with eight or more—the ones most in use. What this MIT team did, Varanasi explains, is to combine two things: a shorter-chain polymer that, by itself, confers some hydrophobic properties and has been enhanced with some extra chemical processing; and a different coating process, called initiated chemical vapor deposition (iCVD), which was developed in recent years by co-author Karen Gleason and her co-workers. Gleason is the Alexander and I. Michael Kasser Professor of Chemical Engineering and associate provost at MIT. Credit for coming up with the best short-chain polymer and making it possible to deposit the polymer with iCVD, Varanasi says, goes primarily to Soto, who is the paper's lead author. The coated fabrics have been subjected to a barrage of tests in the lab, including a standard rain test used by industry. The materials have been bombarded not only with water but with various other liquids including coffee, ketchup, sodium hydroxide, and various acids and bases—and have repelled all of them well.